Products manufactured by Medical Filtration Solutions Ltd are designed and manufactured in the UK using quality systems in accordance with BS EN ISO 13485:2003 and to the Medical Devices Directive 93/42 EEC. 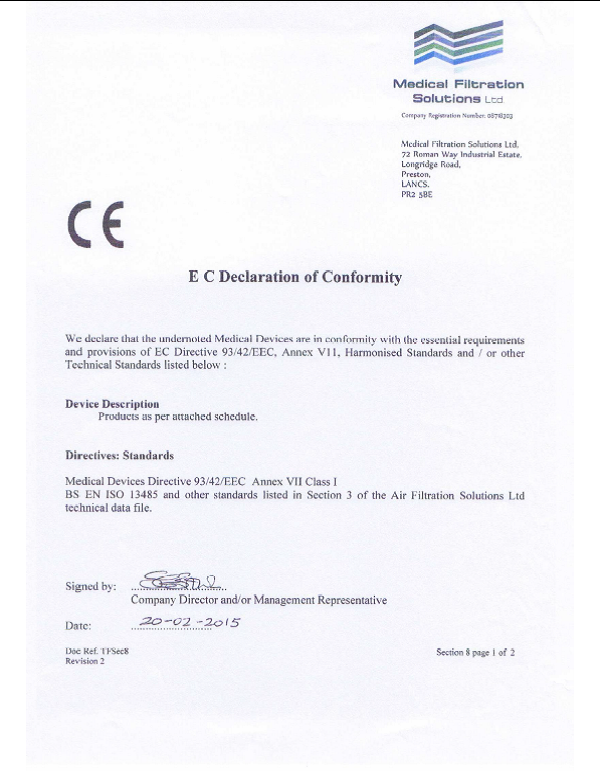 This means that Medical Filtration Solutions Ltd has CE Marking on all filters, please refer to our EC Declaration of Conformity. Each filter is individually tested to BS EN ISO 23328-1 : 2008, for filter integrity and filtration efficiency during manufacture. Nelson Laboratories, Utah, USA have independently tested our filters for bacterial & viral efficiency, testing is conducted using Bacteriaphage @ 25-27nm, a severe test for any filter. Medical Filtration Solutions Ltd filters have been validated to remove the following bacteria and viruses. In this test efficiencies were >99.999% even after 24 hour water saturation. Filters are manufactured in an Environmentally Controlled Area (ECA) to BS EN ISO 14644-1 : Cleanrooms and Associated Controlled Environments – Part1 : Classification of Air Cleanliness. Regular testing is carried out by a third party which includes particle counts, microbial air counts using a Merck Air Sampler and surface counts using contact plates. Unless varied to meet individual contract arrangements all devices are designed, procured, manufactured, inspected, supplied and serviced in accordance with provisions of the companies approved quality management system. The chosen Quality System under which the devices are manufactured is BS EN ISO 13485 : 2003. The products, if used for their intended purpose and in accordance with issued instructions, are unlikely to present any risk to health or safety of the patient, user or third parties. Based upon the devices description and functions as given above, historic operating experience and following a review of the criteria given in all rules of Annexes IX of the directive, Medical Filtration Solutions products are class I according to Rule 4. Technical standards, directives and codes applicable to the devices covered by this technical data are listed below.